Lisa Bielawa final appearance as Composer-in-Residence (BMOP) Premieres her "In medias res". 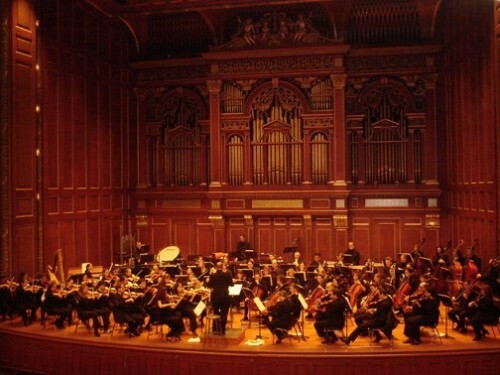 Jordan Hall provides Boston Modern Orchestra Project one ’home’ along with intimate Club Concert venues intended to to reach a different audience for new music and commissioned pieces, still largely attended by composers and BMOP devotees. Boston, Sunday, May 24, 2009 Boston Modern Orchestra Project (BMOP) completed its 12th season with five world premieres by some of new music's best composers, Friday night, May 22nd at Jordan Hall. Truly, a rare event, BMOP is no longer Boston's best-kept secret. Friday's concert was "a uniquely in-depth look at the music that is being composed this year" said Gil Rose, Artistic Director/Conductor of BMOP. Friday's concert ended with the premiere of Lisa Bielawa's complex In medias res (translated, in the middle of everything) in her final appearance as BMOP's 2006-2009 Music Alive Composer-in-Residence. "A piece composed for BMOP and Boston -it epitomizes and pays tribute to her extraordinary ability to build communities wherever she travels." Gil Rose said. Bielawa composed In medias res from individual pieces or, 'Synopsis' composed for soloists and their particular instrument, during her residency. These small works grew from 'cubist drawings' she said, into larger 'paintings'. One, "Synopsis #14: No, No, No-Put That Down" for solo trombone, was performed at BMOP's intimate Club Concert venue (February 3, 2009) at Club CafÃ©. This BMOP venue seeks to reach a different audience for new music and commissioned pieces, was largely attended by composers and BMOP devotees. By weaving together 'Synopsis' for soloists into In medias res, Bielawa brings the individual, asymmetrical voices of jazz into classical music. Told in musical flashbacks like cinema or epic poetry "the piece (In medias res) is, in essence, my thank you and farewell gift to Gil Rose, the players of BMOP, and the entire Boston music community," Bielawa said "They've all welcomed and integrated me into their lives with open arms." Interviewed last week, Bielawa said the arts have an urgent role. It's important to build community, be socially useful and not simply to entertain but, 'invade and inhabit people's ears in a way that's not functional." Bielawa underlined "Music is stubbornly abstract" and "creates avenues for beauty and non-utility" and responds to "need for a life-giving aspect of art making." Bielawa leaves her BMOP 'family' of three years, for Italy as the 2009 Rome Prize winner by the American Academy in Rome. 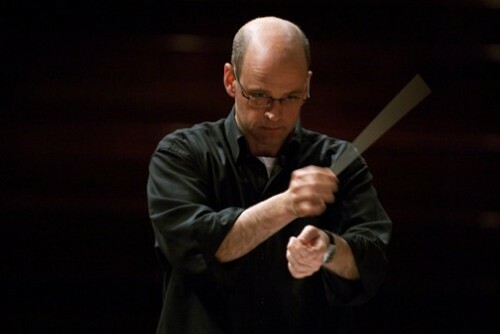 Pop and classicism gently duelled in Eric Moe's longish "Kick and Ride" (2008) a World Premiere and BMOP Commission. The insistent trap drum redirected the orchestra that, in turn, attempted to override scarcely recognizable pop elements. The final brew of "Kick and Ride" blended its layers, blocks of sound and dense textures punctuated by horns. Moe is Professor of Composition and Theory at the University of Pittsburgh. After intermission, on Boston's first summery evening, Lewis Spratlan's delightful "Summer's Day" (2008) Â–a World Premiere and BMOP Commission Â–essayed vignettes of sound, light and languid scenes through a window that were punctuated by heat storms, wind-carried voices and, even, an actual basketball's low, thudding rhythm. Recognizable as the sounds of summer, it was pure delight. Spratlan is a Pulitzer-Prize winning composer who has been on the Amherst College faculty since 1970. Thomas Oboe Lee's full emotional palette mischievously called "..bisbigliando..." or whispering, in Italian, was as variously effervescent and profound as warm evening stroll, in Rome, where he travels whenever possible. Ruminations brought sweet melancholy and vast spaces of dreams that rose-up through Rome's dusty monuments in a bisbigliando or, whirlwinds in our ears. Professor of Music at Boston College since 1990, Lee was born in China, educated at New England Conservatory of Music and Harvard University. The grand gesture of the evening, was Bielawa's conclusion Â–and, gift -to the night's offerings, in the middle of everything (In medias res): a work of such complexity, spinning backward in time, as if from the premise of whispering set-up by Thomas Oboe Lee, that the audience was swept-up, individually enmeshed in a moment abruptly stopped Â–in the middle of everything. BMOP, Gil Rose, Lisa Bielawa and the composers are to be thanked for a memorable, resonant and extraordinarily meaningful evening's farewell until the next season.